Ceres is a high-tech, aquaponic, vertical marijuana farm in Bellevue. The soil-free plants thrive on nutrient rich water continually monitored for their PH and nutrient levels. The Washington Liquor and Cannabis Board was tasked by lawmakers with making recommendations on allowing recreational pot home-growing. The LCB came back with options ranging from four plants to none. Washington lawmakers tasked the Liquor and Cannabis Board with making recommendations on allowing home growing of recreational pot. On Wednesday, the board put the decision back in the Legislature’s lap. The LCB recommended any of the three options it studied: allowing four plants under strict state rules, allowing four plants under city and county control, or continuing to prohibit home grows. The agency’s equivocal stance was not surprising to activists. “I don’t think they wanted anything to do with it in the first place,” said Kevin Oliver, executive director of Washington NORML, the state’s largest marijuana consumer group. 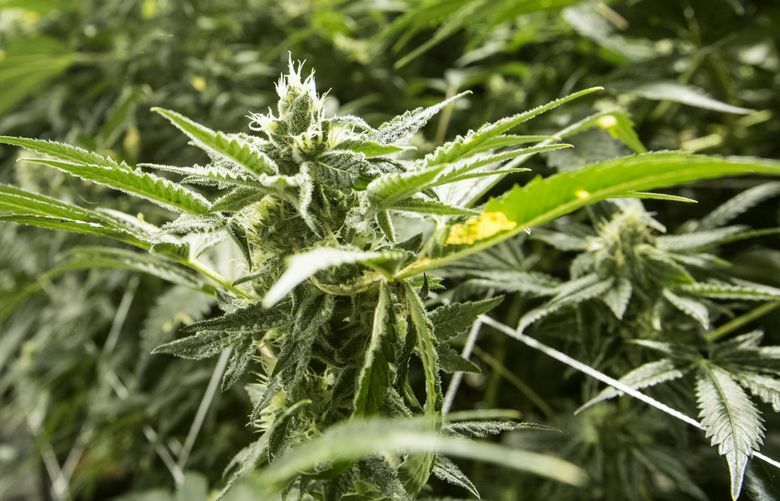 “I suspect they did not take a stance on any one option because they wanted to avoid placing themselves near the center of the inevitable legislative battle that will come,” said John Kingsbury, a longtime medical-marijuana and home-growing advocate. Oliver saw a glimmer of hope in the LCB’s stance. Kingsbury said it reflected the agency’s prioritizing tax revenues over decriminalizing marijuana. The LCB’s 15-page report said the agency initially considered many options but “ultimately dismissed any considerations not consistent with the Cole Memo.” That 2013 memo from the federal Department of Justice (DOJ) has let legalization proceed in eight states as long as they adhere to priorities such as keeping weed from children, cartels and other states. Agency spokesman Brian Smith said the LCB did what the Legislature requested — provide recommendations, plural, that it believed would comport with the Cole Memo. “It was the consensus here that this was the best option,” Smith said. The LCB’s research into home growing revealed diverse viewpoints, which the report reflected, he said. Its chief value, Smith said, is the LCB’s research involving other states and stakeholders including sheriffs, local government officials and advocates. Debates in the Legislature are likely to be contentious, with law enforcement opposing home grows, patients and advocates calling for more leniency, and the pot industry divided on the issue. For instance, Oregon residents can possess four plants without permits or other requirements. And Oregon officials recommended a low number of plants “to minimize diversion risk and a cover for the illicit market,” the LCB reported. Public comments showed overwhelming support for home growing, according to the LCB, with 282 pro-home-grow comments and 93 opposing views. But within the comments supporting home growing there were just 65 that favored the LCB’s four-plant options. Many who supported home grows wanted more plants and less regulation than the LCB proposed. State Rep. David Sawyer, D-Parkland, chairs a committee that approved a six-plant home-growing bill earlier this year. That bill stalled in the full House. Sawyer said the LCB’s report provided what he was hoping — a possible path to home growing under the Cole Memo. “I expected them to say ‘no,’ ” he said. Sawyer said he personally supports home growing. “I’m also not willing to put holes in our compliance to have home-grows,” he said. The other seven states with legal weed all allow home growing. The DOJ has not clamped down on any of them. But none allows more than 12 plants. As for wishful thinking, Oliver saw the LCB’s report as “neutral,” noting it “didn’t say ‘no’ outright” to home growing.” And it didn’t say home growing would cut deeply into the $854 million in state and local taxes collected since legal sales began in 2014. Kingsbury, who objects to strict permitting for home grows, also saw some merit in the LCB’s report. It found that illegal diversion of homegrown weed, particularly in Colorado, resulted from allowing a high number of plants — 99 in Colorado’s case, reduced to 12 this year by state lawmakers. He said the patients’ group he’s part of has been clear it will continue to push for legal small-scale, noncommercial, nonpermitted home grows in Washington state.